7.4 When Does It Make Sense to Use Bioavailability for Arsenic? Prior to evaluating the bioavailability of arsenic in soils, the site-specific and regional background should be determined. The concentration of arsenic naturally occurring in soils depends on the mineralogy of the underlying rock from which it formed. Typical background concentrations in U.S. soils range from nondetectable to 40 mg/kg, with an average of around 5 mg/kg. Soils overlying mineralized zones can have much higher natural concentrations—in the hundreds or even thousands mg/kg arsenic (NAS 1977). Risk-based screening levels for typical land use scenarios such as residential or commercial/industrial (see Table 7-4) are frequently less than the naturally occurring level of arsenic in soil, thus regulatory agencies often recommend a cleanup of arsenic to background levels. As discussed in the decision process chapter, considering background is important for risk assessment of arsenic from soils. When including bioavailability in determining site specific cleanup levels, the bioavailability of arsenic in background soils may be important for unrestricted land use. Note that California’s screening values are lower because of a difference in the recommended oral cancer slope factor and noncancer toxicity criterion for arsenic between California and USEPA. The California Office of Environmental Health Hazard Assessment (OEHHA) recommends an oral slope factor of 9.5 (mg/kg-day)-1, in contrast to the Integrated Risk Information System (IRIS) recommended oral slope factor of 1.5 (mg/kg-day)-1. IRIS is currently reevaluating the toxicity criteria for inorganic arsenic. Both sets of screening levels incorporate the USEPA recommended default RBA of 60%. The concentration of arsenic in site soils and the desired future land use are interrelated considerations when determining whether to perform a site-specific bioavailability assessment. 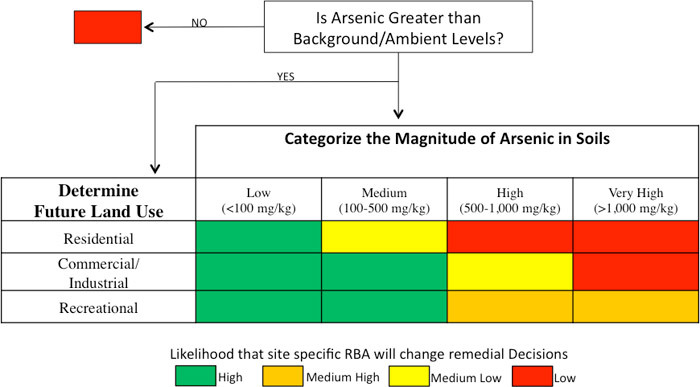 A summary of the likely usefulness of a site-specific RBA for arsenic-contaminated sites is presented in Figure 7-3. This figure was developed considering that cleanups are typically to background concentrations of arsenic because risk-based screening levels are less than typical background concentrations of arsenic in soil. Note that this figure presents general trends and should not be construed as a prescriptive guide. Figure 7‑3. Likelihood of RBA affecting remediation decisions for arsenic-contaminated sites. Estimated impacts are based on comparison to typical naturally occurring concentrations of arsenic. Residential properties as defined by USEPA (2003c) include apartment complexes, schools, daycare centers, playgrounds, parks, green spaces; recreational including walking trails, areas around lakes or ponds, or other areas children may frequent. At medium arsenic concentrations, it is more likely that bioavailability testing will affect the outcome of remediation decisions for a site. The desired land use is also a factor, because the land use dictates acceptable levels of arsenic that may be left in soil while adequately protecting public health. In general, green boxes in the figure indicate a higher confidence that a site-specific evaluation would result in significant alterations to remediation goals, while red boxes indicate that remediation decisions will not likely be altered by site-specific bioavailability results. Boxes in yellow shades indicate an intermediate level of confidence. Future risk model revisions could cause these concentration ranges to shift. Additional information about deciding to pursue site-specific bioavailability testing is included in the decision process chapter. The chemical form or speciation of arsenic in soil plays a significant role in bioavailability. Certain forms of arsenic are sparingly soluble resulting in very low bioavailability measurements; whereas other forms are highly soluble producing elevated bioavailability readings. While undertaking speciation analysis may not be necessary is every instance, it is a tool that can help explain bioavailability results. There are many advantages to understanding the speciation of arsenic when considering arsenic bioavailability. For example, if soil arsenic bioavailability is high, knowing the speciation of arsenic may be inconsequential unless an in situ remediation approach demonstrates that a change in arsenic speciation will assist in determining a change in bioavailability. Likewise, if bioavailability of a soil is low, knowing the speciation of arsenic can add confidence in the potential long-term stability. If low bioavailability is due to an arsenic sulfide phase in the near soil surface, over time oxidation reactions may render arsenic phases that highly bioavailable. Alternatively, if arsenic is sequestered as scorodite (arsenate incorporated into an iron oxide structure and not affected by oxidation), then the low bioavailability of scorodite should persist long-term. Speciation can be useful for discriminating between sources and distinguishing between anthropogenic and natural sources of arsenic. Advanced methods such as spectroscopy and sequential extraction can determine the speciation of arsenic in soils in some special cases. These methods are advanced techniques that are not typically used in a quantitative evaluation of site bioavailability. ITRC does not anticipate nor recommend that these methods be applied to typical site evaluations. The mineralogic speciation of arsenic in soils can strongly affect bioaccessibility and bioavailability. Chemical speciation of soil arsenic provides important supplemental information. Chemical speciation, which is correlated with arsenic bioaccessibility, can be determined using spectroscopic methods to identify arsenic minerals (Table 7-5). For example, soils with arsenic predominantly as arsenopyrite or scorodite likely have low bioaccessibility and bioavailability, indicating that a site-specific evaluation of RBA may be warranted. Conversely, soils with arsenic predominantly as Ca-Fe arsenate minerals (yukonite) likely have high bioaccessibility and bioavailability. These soils also likely have an arsenic RBA near or above the USEPA default of 60%. Source: Adapted with permission from Meunier L, SR Walker, J Wragg, MB Parsons, I Koch, HE Jamieson, and KJ Reimer (2010). Effects of soil composition and mineralogy on the bioaccessibility of arsenic from tailings and soil in gold mine districts of Nova Scotia. ES&T 44:2667-2674. Copyright 2010 American Chemical Society. Sequential extraction procedures (SEP), used to fractionate soil arsenic, can also provide important supplemental information. Soil arsenic in easily extractable soluble or weakly adsorbed fractions are more bioaccessible than soil arsenic in strongly adsorbed and mineral forms. Soils with arsenic predominantly in strongly adsorbed fractions likely have low bioaccessibility and bioavailability (Whitacre, Basta, and Dayton 2013). These soils may have an arsenic RBA below the USEPA default of 60%, thus a site-specific evaluation of arsenic RBA may be warranted. Advanced spectroscopic methods can accurately speciate arsenic in soil (Scheckel et al. 2009). Several reliable spectroscopic methods can determine metal speciation, but the most authoritative approach is X-ray absorption spectroscopy (XAS). XAS determines the oxidation state, coordination environment, interatomic bond distances, and identity of nearest-neighbor elements relative to the arsenic soil contaminant. Because it requires high energy x-rays, XAS data collection can only be accomplished with a synchrotron radiation source such as the one at the advanced photon source (APS) synchrotron radiation research facility at Argonne National Laboratory. Recent results show that speciation of arsenic provides information on arsenic RBA. The following is a list of arsenic compounds/species in decreasing order of RBA: lead arsenate pesticide, adsorbed arsenic (V), arsenic sulfides (Basta et al. 2016). While arsenic speciation may be useful for understanding site characteristics, it has not been shown to quantitatively predict IVBA or arsenic RBA. Multiple linear regression between arsenic minerals and arsenic RBA only explained 54% of the total variance using the adult mouse model (Basta et al. 2016). Similarly, Bradham et al. (2011) reported arsenopyrite was a significant predictor of arsenic RBA in 11 soils using the adult mouse bioassay, but the r2 value of 0.28 supports the conclusion that arsenic speciation does not accurately predict arsenic RBA. Brattin et al. (2013) reported that while incorporating arsenic mineralogy as determined by electron microprobe analysis (EMPA) evaluation could improve an IVIVC when included with IVBA results, it did not provide a useful prediction of RBA in the absence of the IVBA data and was not likely to be cost effective or informative in risk assessment. Several soil extraction methods measure chemical forms of arsenic that are bioaccessible. Soil extraction data can provide supporting information to confirm bioaccessibility measured by in vitro gastrointestinal methods. Single and sequential extraction methods are used to determine the amount of arsenic in specific but operationally defined chemical groups, or “fractions.” Chemical fractions range from water soluble arsenic to recalcitrant arsenic trapped in mineral lattices. Soluble or weakly adsorbed arsenic fractions are regarded as more available than arsenic in strongly adsorbed and occluded forms. Rodriguez et al. (2003) reported that only the acid soluble fractions were bioaccessible. This finding is consistent with dissolution of arsenic under the acidic (pH 2) conditions of the stomach. Soils with high reactive iron (Yang et al. 2002) or iron and aluminum oxide clay content exhibit lower bioaccessibility (Whitacre, Basta, and Dayton 2013). Most of the arsenic is found in Fractions 3, 4, and 5. Arsenic in Fractions 3, 4, and 5 are associated with strong covalent bonding between arsenate and iron oxide surfaces and have low bioaccessibility (Beak et al. 2006a). In general, soils with arsenic associated with amorphous to crystalline oxides of iron and aluminum and residual phases (Fractions 3, 4, and 5) are less bioaccessible. Several single extraction procedures, hydroxylamine hydrochloride or acid ammonium oxalate, are strongly correlated with bioaccessible arsenic (Girouard and Zagury 2009; Rodriguez et al. 2003). Similar to sequential extractions, the single extractions best correlated with bioaccessible arsenic are those that extract some of the iron and aluminum oxide clay.